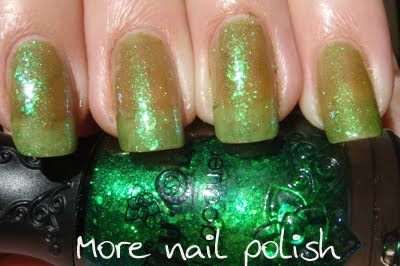 This is the last of my Nfu Oh flakey polishes. Unfortunately I don't have #51 so I just have to make do with the less popular ones that I can actually buy here in Australia. 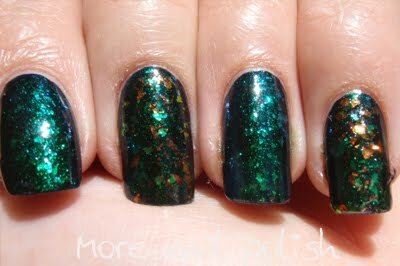 This is #56 which is an amazing rich emerald green, with a green shimmer and green flakies. 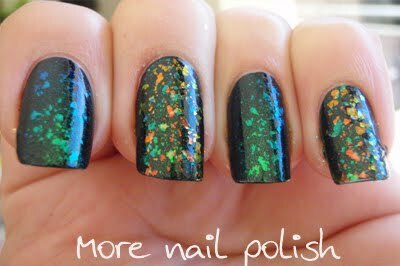 On some angles it also has a blue duochrome effect on the green flakes. Again, it's too sheer for my liking to wear on it's own. And for some reason it makes me feel like the wicked witch of the west wearing it. Why is that? Up close of the pretty green flakies. And here is some magic over black. I felt like mixing it up a bit, so I did one coat of #56 on all nails, but then added one coat of #43 with the orange flakies too. This pic in the sun is hard to see all the beautiful colours. Indoors you can see the colour contrast and you can see the multi colour effect of the blue and green on the index finger. And even closer. Soooo pretty. 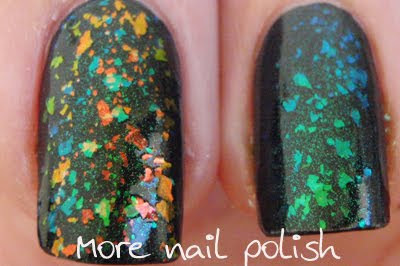 So while I pretty much hate my Nfu Oh flakey polishes on their own, I absolutley love them layered over other colours. It's such a shame that these polishes aren't more easily available in Australia. As far as I know there is only one distributor and they have a total monopoly on the market and often charge around $30 for a single bottle, especially of the popular polishes. Where to buy it from Australia?